Welcome to the Scott Polar Research Institute Museum news section. 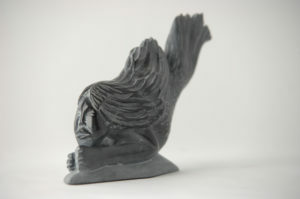 Soapstone carving. Sedna, ‘Taleelayuk’ the sea goddess by Manasie Akpaliapik, 1992. Sedna (who might also be called Nuliajuk or Taleelayuk to give her just a few of her many names) is an important cultural figure for Inuit across the Arctic and she has an impressive origin story to match. Sedna’s story varies slightly from place to place and region to region, but one version of the legend starts with Sedna as a human woman who has refused all her would-be suitors. Eventually, she falls for a man who beguiles her with his voice and goes to live with him on an island. When they reach the island, the man she has married transforms and Sedna realises that he isn’t really a human man at all – he’s a seabird. Sedna is not happy living on the island with the seabird. Her father comes to visit her and while he is there she persuades him to help her escape. But the seabird, realising that Sedna is trying to leave the island, calls up a storm which rocks her father’s boat so much that he and Sedna think they will be killed. Sedna’s father, wanting to save himself, decides that the only way to stop the storm is to throw her overboard. Sedna manages to cling to the side of the boat by her fingers but her father chops them off so that she can’t hold on and she sinks to the bottom of the sea. She grows a tail like a fish and her fingers which have been cut off become the first sea mammals: the seals, walruses and whales of the Arctic. Sedna now lives at the bottom of the sea and controls all of the sea mammals, which are the traditional food source of the Inuit. It is important that she is not upset or offended by human actions because she has the power to take all the sea mammals away, keeping them at the bottom of the sea with her and away from Inuit hunters. In the past, when Inuit were entirely dependent on ‘country food’ – or food harvested from the land – a lack of sea mammals would have resulted in starvation. 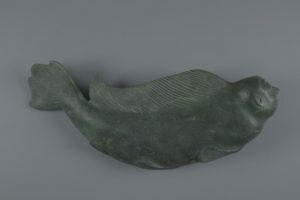 Green serpentine carving of Sedna, ‘Taleelayuk’ the sea goddess by Kaka Ashoona, 1961. Shamans were traditionally the link between Sedna and the Inuit (before the loss of the shamanic tradition as a result of contact with Christian missionaries to the Arctic). If there were no sea creatures to be found, the shaman would visit Sedna underneath the sea to find out what was wrong. The shaman would then have to negotiate with Sedna so that she would allow the animals to be available for the Inuit again (sometimes these negotiations took the form of the shaman brushing her hair because, not having her fingers, Sedna is unable to do it herself). By having this total control over the principal sources of food, (as well as the clothing and fuel which were also produced from sea mammals) Sedna held the line between human life and death in her hands. Black soapstone carving of Sedna, ‘Taleelayuk’ the sea goddess by Tarulagak. Before 1966. Although the details of Sedna and her powers vary across the Arctic, the ideas of human to animal transformations (and vice versa), and the image of a female controlling force over the sea mammals are important concepts which can be found across many Arctic cultural groups. Visual art is often theorised as helping artists to represent and understand the world around them, and communicate this knowledge to the audience of people who see their works. It is unsurprising then that Sedna, who is such an important traditional cultural figure, is depicted so regularly in Inuit art. We are very fortunate to have such beautiful representations of her in our collection. It’s been a bumper season for new acquisitions at The Polar Museum! As well as wrestling with the all-important ethical and legal complexities of bringing artefacts collected in the distant past into the safe care of an accredited public institution like SPRI, we have also had some relatively ‘easy wins’ this autumn. Without a doubt, the gift of Charles Royds’ telescope has been the highlight of these. 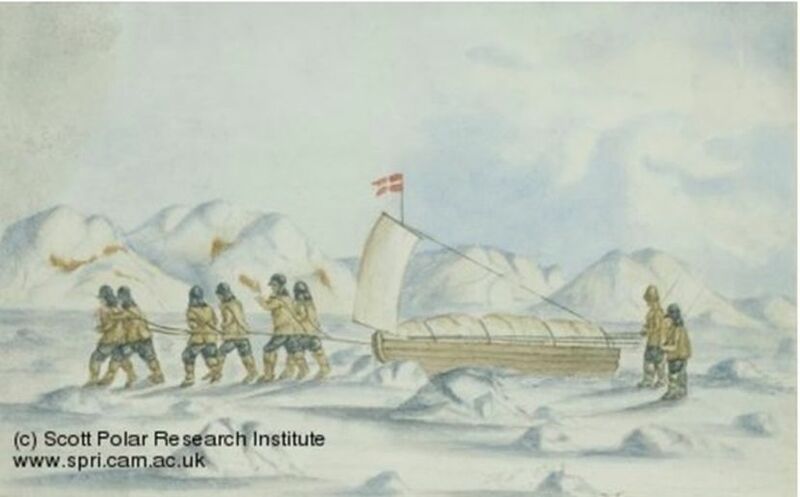 As some of you longer-time readers may be aware, back in 2015 the Scott Polar Research Institute was awarded £500,000 through the Heritage Lottery Fund programme, Collecting Cultures, to enhance our understanding of, and public engagement with, the Shackleton story. One of the recent focuses of this effort has been a new display in our soon-to-be-refurbished Friends Room in the Library (open to the public!) that centres on the story of Shackleton and the people he worked with. This left us casting around for interesting objects we could use that weren’t already on display in the permanent gallery. 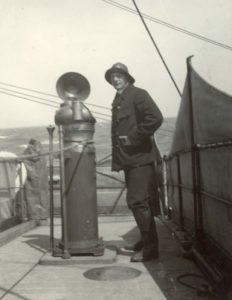 Lieutenant Royds standing on the bridge of the ship beside the compass. (c) Scott Polar Research Institute. Sir Charles William Rawson Royds was already a distinguished and well-travelled officer in the Royal Navy before he was picked in 1901 along with Robert Falcon Scott to serve as First Lieutenant aboard the Discovery. During his three years aboard Discovery the towering Royds served alongside the ship’s then little-known Third Lieutenant, Sir Ernest Henry Shackleton, who in addition to overseeing the Antarctic expedition’s supplies was also in charge of maintaining morale. Royds meanwhile acted as the expedition meteorologist and oversaw the daily smooth sailing of the ship under Captain Scott’s direction—as the person with overall charge of the ship the naval convention was that Scott be called Captain, though his actual rank in the Royal Navy at the time was Commander. Cape Royds on Ross Island in Antarctica was eventually discovered and named for Royds by the crew of Discovery during the expedition. After this episode, Royds returned to his regular naval duties serving in British waters, the Mediterranean and farther afield before finally retiring with the rank of Rear Admiral. His trusty spyglass, however, continued to bear the signs of adaptation for polar use. 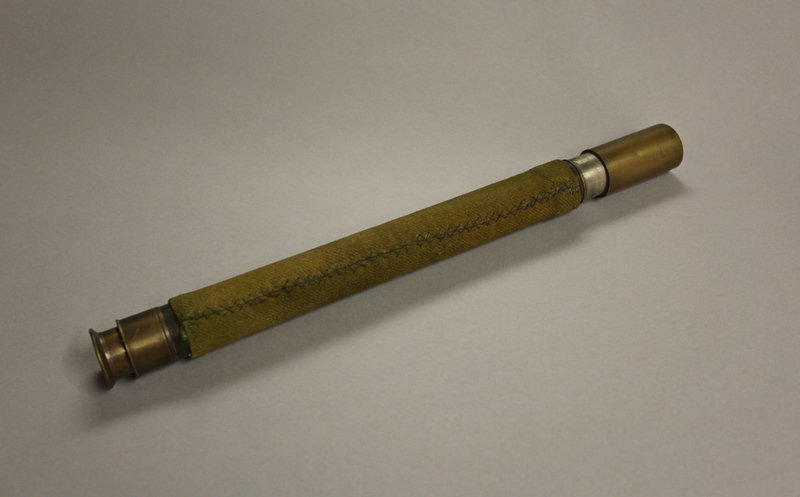 The most immediately striking feature of the telescope is its covering of green woollen blanket cloth, which has been rather crudely stitched on with cotton thread, I like to imagine, by Royds’ own numb, chilly hands one cold day in Antarctica. My assumption here is that the blanket would have provided extra protection to the instrument during arduous sledging journeys and would also prevent a wayward bare hand from inadvertently freezing to the metal casing in the sub-zero temperatures. 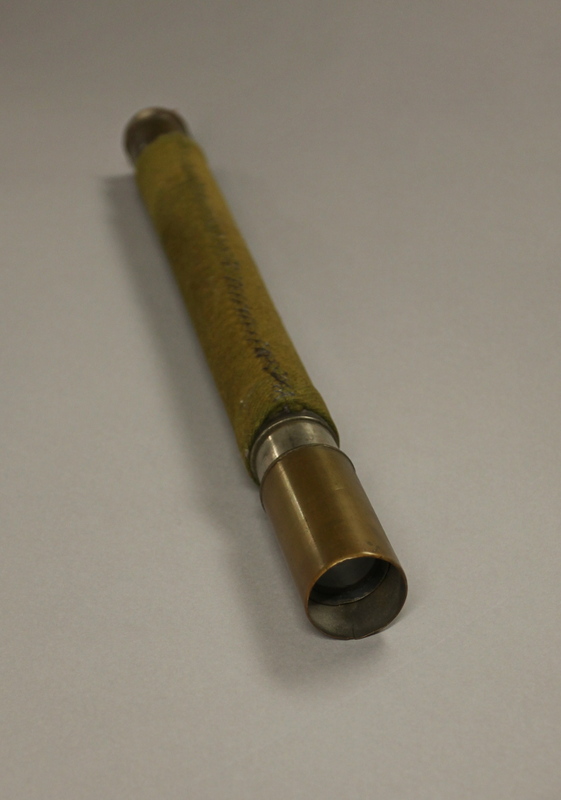 The then owner of the telescope had already sent some excellent images and provenance information with their initial letter to Professor Dowdeswell detailing how their ancestor, Lieutenant Commander Vivian Edward Marshall May, acquired the telescope early in his career. Marshall May, himself a Royal Navy officer, received the telescope, along with a sextant and sword, on his passing out of the Royal Navy College at Dartmouth from his presumably very proud Godfather, Rear-Admiral Royds. Where the sword and sextant are today remains a mystery for the time-being. As I said, a nice ‘easy win’! But, the work isn’t done. Just because something is formally added to the museum register doesn’t mean it will be frozen in time (no pun intended) with the story never to change. I would still like to know where the sword and sextant ended up, whether the cover on the telescope really is a specific polar adaptation and where else it has been. It isn’t even clear what make or model it is. There are no visible markings and I’m no telescope specialist… Even the easy ones raise more questions than they answer. I knew that much. It was plain to me and anyone else who had visited the Museum at SPRI that we have sculpture in the collection. 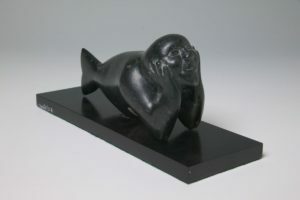 In fact, SPRI has in its care one of the largest collections of Inuit sculpture in Great Britain. But, what I didn’t know was just what other sorts of sculpture we have at SPRI, and how many sculptures are there in total. 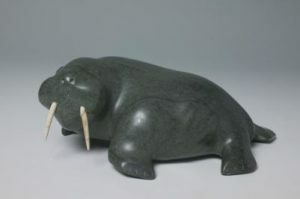 (© SPRI) An older SPRI image of a walrus carved from soapstone and walrus ivory by artist Joe Emiqutailaq, Belcher Islands, Nunavut, c. 1970. However, this time round Art UK is interested in getting some of our more three-dimensional artworks out there. This new project is part of a wider, three-year national effort to digitise 170,000 sculptures of all types from public collections around the country. The first task, then, was for me to put together a working list of all the items in our care that Art UK regard as sculpture. The only major caveats for this were that 1) the items had to have been made in the last 1000 years, and 2) nothing made of ivory, bone, jade or wax was to be included. The first condition wasn’t going to be much of a problem for us—aside from a few small archaeological pieces and geological specimens, the collections at SPRI don’t go back more than a few centuries. But, avoiding ivory and bone was going to be difficult: indigenous carvers and artists from across the Arctic have long used the bones and ivory from the tusks and teeth of marine mammals traditionally hunted as part of their subsistence diet for raw materials. Understandably, Art UK are concerned to avoid showing-off materials coming from contentious sources, such as ivory from protected species like the endangered African elephant, but the marine ivory at SPRI is from permitted indigenous sources and so is less problematic. Once the Museum Curator and I explained our case, Art UK were happy to make an exception for us. Now we were going to be able to showcase the best examples from the full range of sculptural items at SPRI. All I had to do was search exhaustively through our digital database, find everything that matched the Art UK definition of a sculpture—avoiding things that look too at home on nanna’s mantelpiece—and highlight the items that would benefit from new photography. Easy! 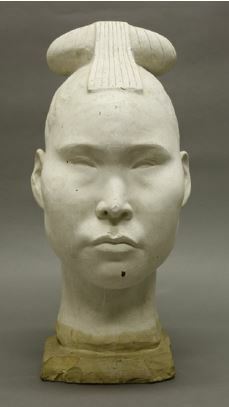 (© SPRI) Another older SPRI image of a plaster-cast bust of a Greenland Inuit woman in by Eigil Knuth, originally made in 1937. Once we had our final total of 145 items we were able to send the list and arrange the photoshoot with Art UK. Happily our own Josh Murfitt from the Cambridge University Museum of Archaeology and Anthropology was the one who answered the call, being contracted out by the charity to come for two days to help us capture all the details of the fabulous sculpture in our care. (Image © SPRI) Josh photographs a carved Arctic crane bird, usually seen on display in our permanent gallery. We had great fun trying to figure out which was the back and which was the front of some of the more abstract pieces, and we even made a few discoveries about some of them along the way. One carving inscribed on both sides with Inuktitut syllabic script—the symbols used to represent the syllables in the Inuit language—had no known artist or date. In the process of turning it round to check it for inscriptions, we saw the syllabic signature of the artist, Tumasi Kala, on the base. Other items were so large and bulky we needed a trolley to move them the few metres from our store to the temporary photo studio space that Josh had set up. It was backbreaking work, but I can’t wait to see the final results. Watch this space! 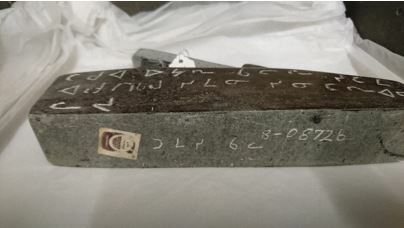 (Image © SPRI) The base of a sculpture signed by the previously unknown artist in Inuktitut syllabic lettering. The masts were bent and a lot of the rigging was broken or missing sections. There was also a very distracting yellow coating over the metal which made it look almost more like a brass model than a silver one. 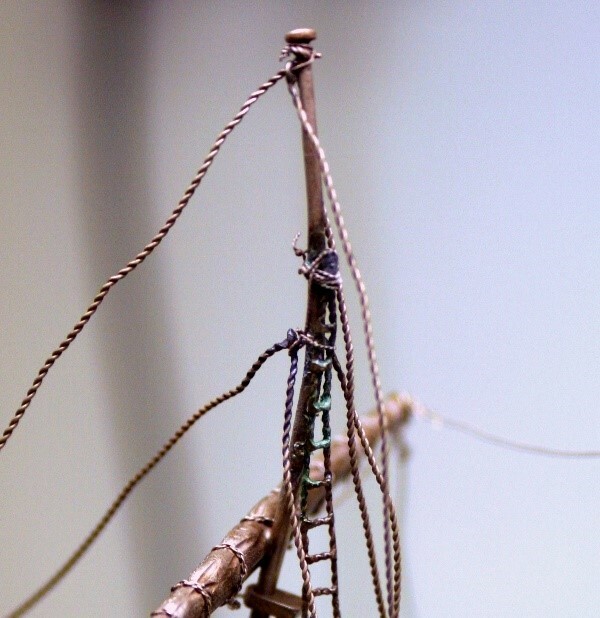 On closer inspection there were lots of old repairs to the model, either with solder, or with new wire rigging which didn’t match the old, or with original rigging wire repositioned or used to tie loose bits on. Even the bowsprit was held on with a blob of Blu-tak inside the hull. All in all it would be a daunting task to try and restore some of its original beauty. And why did it look so battered in the first place? 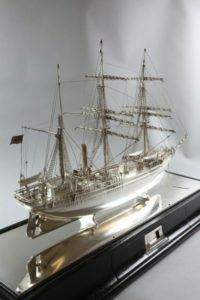 The model was actually a present to Captain Robert Falcon Scott’s son Peter, given to him in honour of his father’s gallantry in 1913, soon after the news of Scott’s death was announced in Britain. The subscribers of “John Bull Magazine” had a whip-round and commissioned the model for Peter, whom they called “John Bull’s boy”. Peter was 4 at the time. 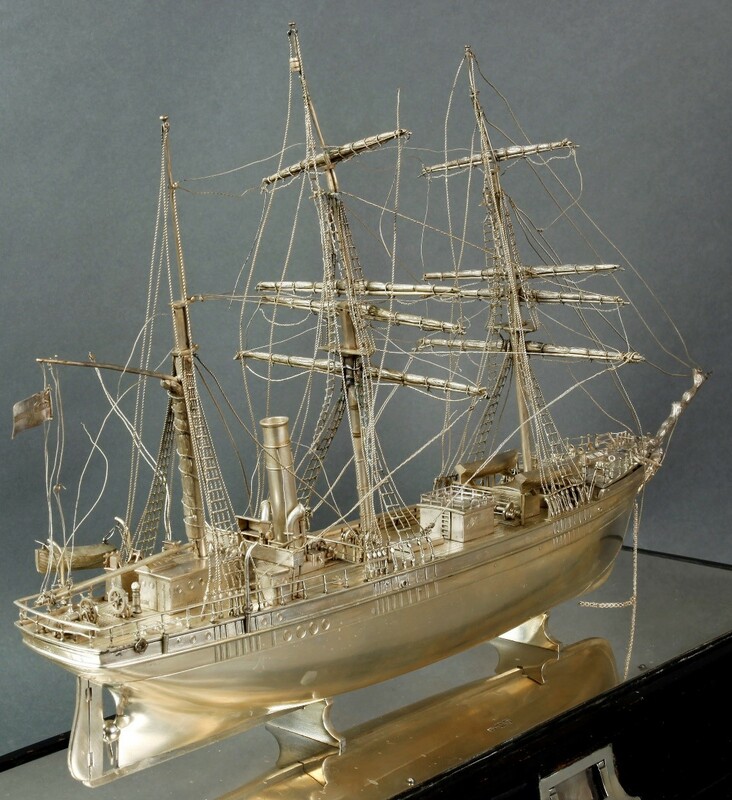 To a modern eye it seems extraordinary enough to make a ship model out of sterling silver, although in fact this was in vogue in the 1910’s and this one was made by the famous London silversmiths, Mappin and Webb. It seems even more unusual to give such a thing as a present to a 4 year-old boy. But the damage to the rigging, masts and bowsprit, not to mention the amateur repairs, all show that Peter must have played with the ship (and possibly dropped it), and that it was part of his life. Peter’s family remember the ship being in their childhood home, and from there it was very kindly given to the museum. When conserving the model we wanted to repair much of the damage without losing all traces of this history, which is what makes the ship unique. The first stage was to remove the old yellow coating. This was originally applied to stop the ship from tarnishing, but had become disfiguring in its own right. Removing it was enormously time-consuming, and was done with the help of ultra-violet light, as described in an earlier blog post. Once the coating was gone and the silver gently polished, repairs to the masts and rigging could start. We had a choice to take the model to a specialist conservation silversmith, who could deconstruct the rigging and completely restore it. But this would erase all the quirks introduced by Peter Scott over the years and lose an important part of the ship’s story. So instead the repairs were done by me, as the in-house conservator at the museum, using less interventive techniques. As a non-rigging expert, understanding the rig and repairing it was an intimidating prospect, so I enlisted help from Janet West, Emeritus Associate at the Scott Polar Research Institute and a renowned expert on scrimshaw. Understanding ship rigging is bread and butter to her and we spent invaluable hours looking at the model and comparing it to photos of the Terra Nova in Antarctica. 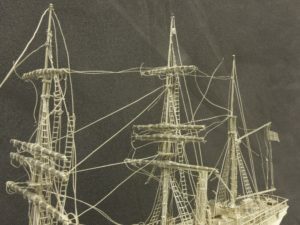 It turned out that, although the hull was a perfect replica of the ship (according to the original plans) the rigging was very approximate and could not have worked in real life. To be fair to the model maker, it would be almost impossible to rig the model realistically because the number of criss-crossing wires would become overwhelming. The result now strikes a balance – the ship still shows evidence of its past but has regained some of its “wow factor” too. Three sisters known as The Misses Lefroy’ donated the majority of the Franklin relics held by the Polar Museum. How the Misses Lefroy came to have so many Franklin relics is itself a tragic story; a polar love triangle caught up in the drama and devastating loss of the last Franklin voyage. The three Lefroy sisters, Jessie, from Winchester and Louie and M. Isabel (Mary-Isabella), who lived together in Bentworth, Hants, were the daughters of George Benjamin Austen Lefroy, a grand nephew of Jane Austen, and the great nieces of Franklin through their mother Emma Cracroft. Franklin had a direct heir in Eleanor Isabella Franklin, the daughter from his first marriage to Eleanor Porden. However, when Lady Jane Franklin launched her quest to search for the lost expedition, Eleanor Isabella’s rights to inherit were waived to fund her stepmother’s campaign to mobilise public feeling and Admiralty support. Central to Jane’s campaign was the transformation of detritus from the Franklin expedition recovered by the search parties into hallowed relics through engravings and great public exhibitions. Eleanor Isabella would have nothing to do with it. In fact the Franklin relics passed to the Misses Lefroy from their maiden aunt, Sophia (Sophy) Cracroft, from whom they inherited. 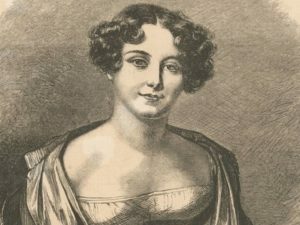 Sophy Cracroft was Franklin’s eldest niece, Jane Franklin’s companion from her marriage to the polar explorer in 1836, and aide-de-cape from the launch of Lady Jane’s campaign until her death in 1875. This blog post is concerned with the polar love triangle in the grand tragedy of the Franklin expedition because of its direct significance for Sophy’s spinsterhood, and so the inheritance of the Misses Lefroy. Sophy Cracroft was born in 1816, the eldest daughter of Isabella Franklin and Thomas Cracroft and niece of the Arctic explorer, John Franklin. In 1836, she accompanied Franklin, his second wife, Jane, and his daughter from his first marriage, Eleanor, to Van Diemen’s Land [Tasmania] after Franklin had accepted the post of lieutenant governor. It was four years later, while in Tasmania that Sophy, (age 24), and Eleanor (age 16) would meet the romantic interests that would dominate their future lives. Around the time of his 24th birthday, in March 1840, John Philip Gell came to stay with the Franklins. He was an Anglican clergyman from Derbyshire, recently graduated from Trinity College, Cambridge; and came to Van Diemen’s Land with the strongest recommendation from educator and historian Thomas Arnold to be head of the first institution of higher education under Franklin’s governance. He became an immediate friend of the family, and nine years on, following his return to England, Gell joined the family proper as Eleanor’s husband. In August 1840, just a few months on from Gell’s arrival at the Franklins, there was a more dramatic disruption to Van Diemen’s Land society life, in the arrival of two ships, the “Erebus” and the “Terror”, with naval officers Francis Rawdon Moira Crozier as Captain of the latter and James Clark Ross in overall command. In 1839 the British government, under pressure from the Royal Society and the British Academy, had decided to send an expedition to the Antarctic for Scientific and Geographical research. The two ships, Erebus and Terror, left Moorgate Road on the 30 September 1839 and sailed south, landing at Hobart Town, in the summer of 1840 where they were hospitably received by Sir John Franklin, Lt. Governor of Tasmania, prompting a whirlwind of balls and celebrations. On their return from Antarctica in 1841 the fancy dress ball held aboard the ships to thank the Franklins was the event of the year for Hobart Town. To host the 350 guests, the Erebus and Terror were lashed together draped in red baize and dripping with chandeliers and flowers. More than 250 mirrors were arranged on the sides of the vessels to reflect the flickering candlelight; as the dazzled visitors approached the floating ballroom, the 51st Regiment of the Hobart Town Quadrille Band charmed them along a gangway made from a line of boats decked with flags and the floral emblem of the isle. The biggest naval ball in Tasmanian colonial history, the whole event is still remembered as ‘the Glorious first of June’. With Sir John Franklin presiding in full dress uniform, Lady Jane and Sophia Cracroft by his side, the “Two Captains” were the object of every woman’s dance card. When, just days later, Erebus and Terror departed, Crozier was deeply in love with Sophia, and she with his gallant commander James Clark Ross well known as ‘the handsomest man in the Navy’. 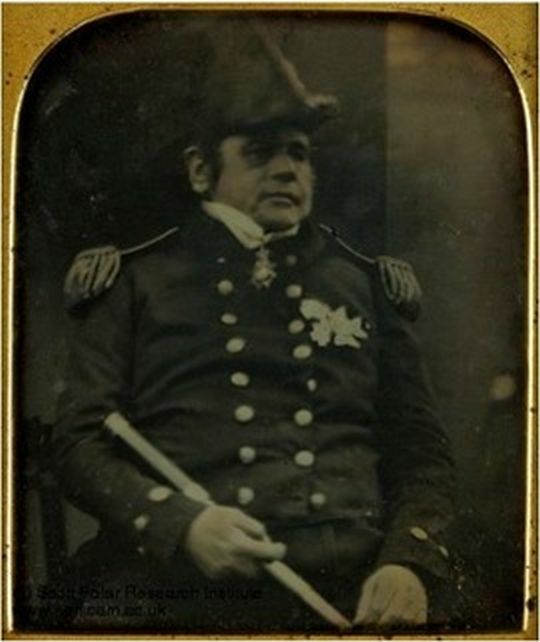 Left: copy of daguerreotype portrait taken of Francis Crozier shortly before the Franklin expedition departed in 1845. 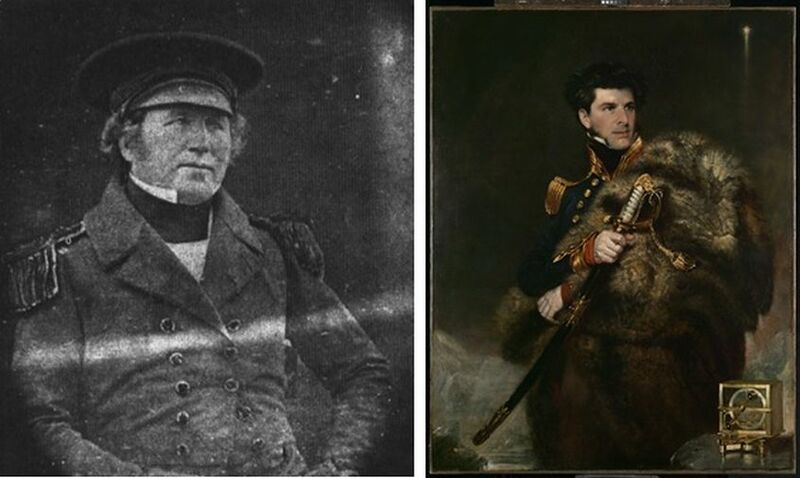 Right: Oil on canvas of James Clark Ross, made in 1834 by John Robert Wildman. The highly romanticised portrayal marks Ross’s return from his 1829-33 Arctic expedition. Over his shoulder is draped a bear skin while the Pole Star shines in the top right of the image. Three years on, the Franklins and Sophia left Van Diemen’s Land, reaching Britain in June 1844, to find Crozier still love-struck and Ross a newly married man. When the Admiralty approved plans for an Arctic expedition in early 1845, it was said that it was Ross’s promise to his bride, Anne née Coulman, which prevented him from taking command. This at least was the public story, however the Erebus and Terror had undergone further transformations since they were decked out in drapes and mirrors; the vessels were now fitted with steam engines taken from London and Greenwich railway locomotives, and privately Ross’s dislike of steam navigation played a significant role. Though Crozier and Ross shared the title of two of the most experienced polar explorer of the day, a powerful lobby manoeuvred for Franklin and secured him command of the expedition with Crozier as his second, Captain of the Terror. Further, in an unusual move thought by some to have been motivated by prejudice against Crozier for being too poor, too Presbyterian and too Irish to be a proper gentleman, the selection of officers was given to his junior, James Fitzjames. In the final days before the expedition departed Crozier received a further blow that left him in a depressed state marked by Franklin and all his fellow officers – his latest rejection by Sophy, the last proposal he would make. Just sixteen months later, on 12 September 1846, the Erebus and Terror became trapped in ice. The same two ships which five years before had formed a floating ballroom for young lovers became a prison for a slow death. When Sir John Franklin died on June 11, 1847, two years after the expedition’s departure, Crozier assumed leadership of the beleaguered mission, and when in April the following year the ships were abandoned, nine officers and fifteen men already dead, 105 souls set out under Crozier’s command for Back River (formerly Great Fish River). They marched south and then east, searching for food in a single group pulling several boat/sledges. The majority of the men died within two hundred miles of the original landing, dropping as they marched. Inuit witnesses reported a large camp at Terror Bay, with tents, graves, cannibalised bodies and a pile of skulls. Later, hauntingly, the Inuit encountered a small party in Washington Bay, headed east. The Inuit described seeing a white shape moving in the distance which at first they though was a bear but which proved to be a party of around forty white men (kabloona) dragging a boat on which a sail had been set. All the men were suffering from an advanced state of scurvy and the Inuit were convinced of signs of cannibalism. The Inuit testimony, vilified and denounced for generations, has subsequently been confirmed by the overwhelming physical evidence not least from the skeletal remains of the men found scattered along the coast or mainland. Though the evidence indicates all 129 were dead by the winter of 1848, American search expeditions of the 1850 and 60s caused a stir in Britain with ‘hobgoblin tales’ of a survivor, a great officer and excellent hunter so skilled that he shared food with the Inuit, thought to be Crozier. Jane and Sophia first heard the rumours in October 1865. Since 1860 the two women had travelled all over the world, visiting Alaska, the United States, Hawaii, Canada, South America, China, Japan, India and Europe; with a royal welcome in America and the Canadas, In 1869 they returned to the United States to investigate the rumours and inspect the most recently recovered relics. It was only after these interviews that Jane and Sophia finally accepted the evidence of cannibalism. Sophia Cracroft never married, her journals, correspondence and papers are held by the Scott Polar Research Institute Archives, located just above the Polar Museum. Through her role as daughter to the childless Jane, Cracroft became heir to a polar reliquary, much of which passed to the Polar Museum through her nieces, the Misses Lefroy. Newly fitted with screw propellers powered by steam engines taken from railway locomotives, Erebus and Terror made good time across the Atlantic, sighting Greenland on 25 June, crossing the Arctic Circle on the 30th and reaching the Whale Fish Islands on 4 July. 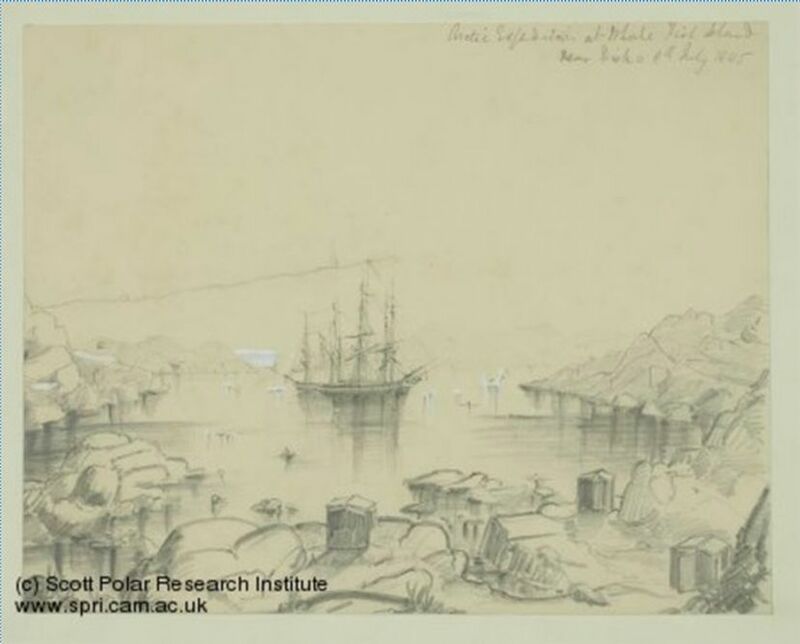 Eight days later, on 12 July 1845, Franklin sent a final report to the Admiralty together with a sixteen pages for Jane; a cumulative letter he had started the day after the expedition crossed the Arctic Circle. This was the last communication Jane and the Admiralty ever received from Franklin. He died one year eleven months later, on 11 June 1847. Between 1847 and 1859 some thirty expeditions were sent to discover the fate of Franklin. Most were sponsored by the Admiralty but some by Lady Franklin herself, (see Y:2011/49/1 and Y:2011/49/2) or by the wealthy American merchant Henry Grinnell (see Y:57/1), after Lady Franklin appealed to the president of the United States. Over the twelve years of hunting, with terrible costs in human life, as well as ships and investment, the search parties would recover only discarded fragments of the Franklin expedition. 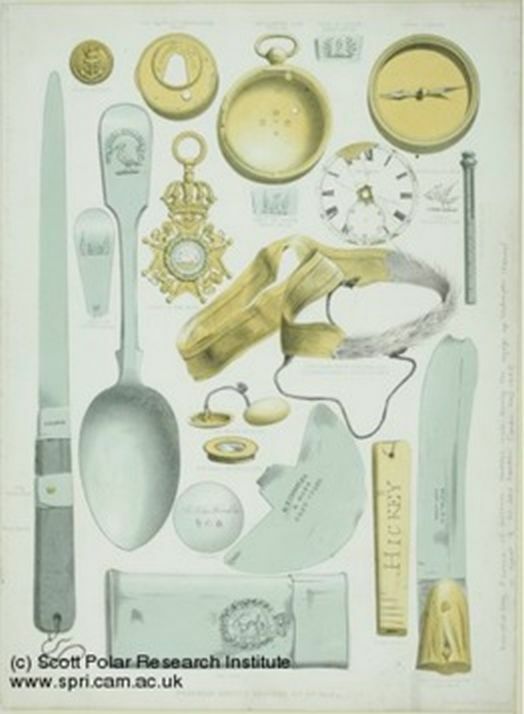 This personal detritus, gathered, bought, and bartered by the search parties, was publicly displayed in government and military exhibitions and widely reproduced in the periodicals, newspapers and catalogues of the day. These fragments, known as the Franklin relics, became the stuff of national worship. For generations then and since the stories of the Franklin expedition – heroism and horror – have been pieced together through these relics. 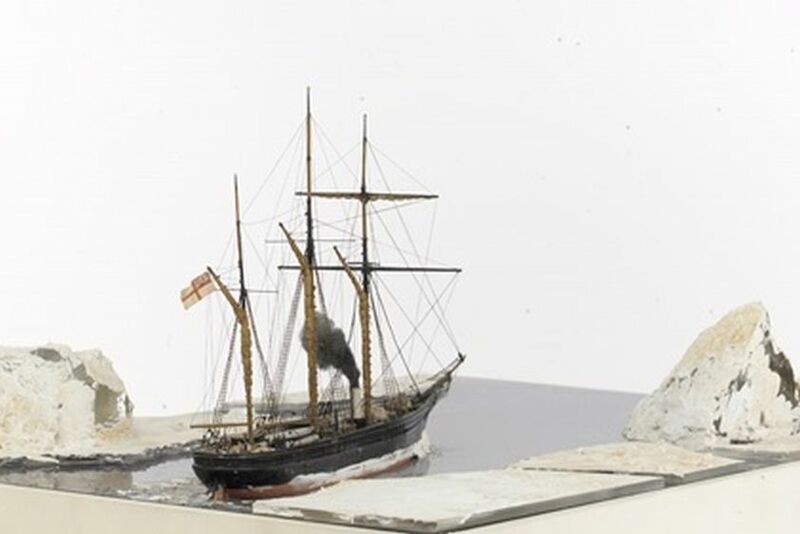 The Polar Museum’s collection spans the full twelve years of searches, with a substantial number associated with the British Franklin search expedition 1857-59 (Fox), commanded by Francis Leopold McClintock. Even part of the search expedition itself remains in the collection, a piece of the screw turnail from the outer sheathing of the ‘Fox’, McClintock’s search ship, taken from the remains of the hulk at Godhaven, Disco Island, West Greenland on July 7th, 1931, by the donor. The Fox was a screw, 3-masted schooner-yacht with one funnel, 177 tons gross. She was originally built for Sir Richard Sutton, at a cost of about £5000, the ship’s hull diagonally planked with Scotch larch on the inside and East India teak on the outside, and the two-cylinder auxiliary steam engine of 16 n.h.p. gave a speed of about seven knots. After Sutton’s death, in 1855, the Fox was sold to Lady Franklin in a partly dismantled state for £2000. 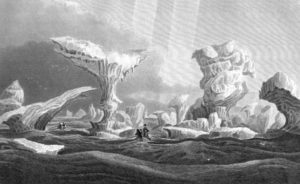 In 1857 the ‘Fox’ was strengthened to resist polar ice largely at the expense of Lady Franklin, before setting out on the privately funded expedition in search of Lady Franklin’s husband Sir John Franklin. He had been missing for twelve years since his attempt to discover a sea route north of the American mainland. 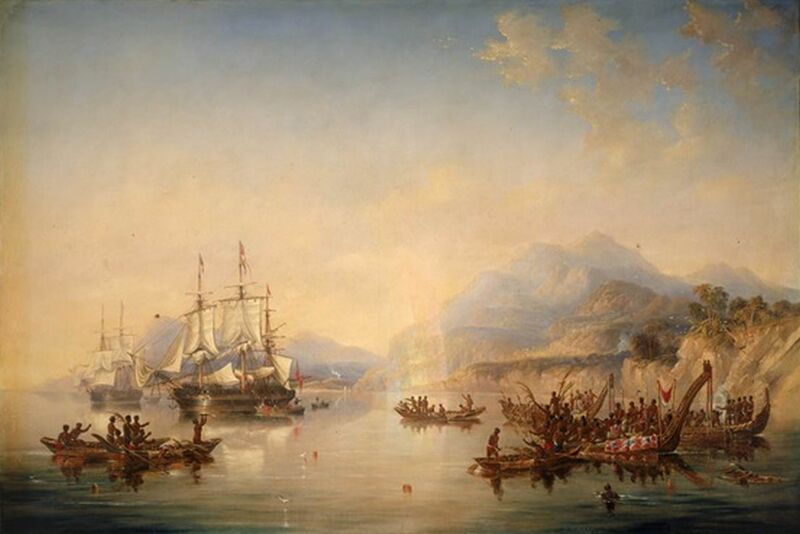 Following reports that the Inuit had seen Europeans on King William Island and the nearby mainland, the expedition aimed to rescue any survivors, retrieve relics, and establish if Sir John’s expedition had achieved its mission. It carried with it a number of copies of Sir John Franklin’s Star of the Guelphic Order made for distribution amongst the Inuit. The Polar Museum holds two such copies, one in full colour (N: 988) and the other plain (Y: 54/20/5). The badge of Knight Commander of the Royal Hanoverian Guelphic Order was awarded to Sir John Franklin on 25 January 1836. The original was made that year, 1836, from enamel and gold, and is now held by Greenwich National Maritime Museum (AAA2079). In 1854 Dr John Rae, Captain of the British Hudson Bay Company exploring and Franklin search expedition 1853-54, encountered Inuit from Pelly Bay with oral accounts and artefacts from Franklin’s lost expedition, which he purchased. Franklin’s original badge was among their number. The Inuit told Rae that they had heard accounts of multiple bodies discovered near the Great Fish (Back) River as well as evidence of widespread British survivor cannibalism, which Rae reported to the Admiralty and The Times upon his return. 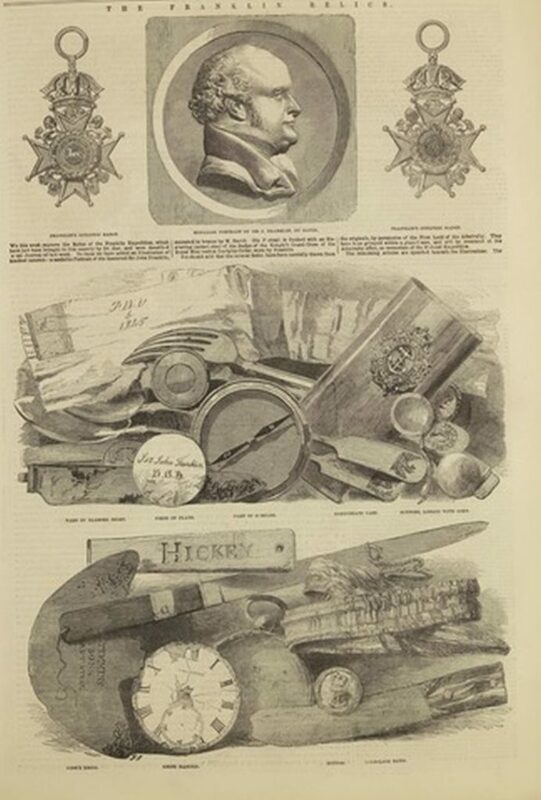 Full-page engravings of the relics brought back by Rae, together with the inscription “Repulse Bay, 8th July, 1854”, were printed in the November 1854 Illustrated London News, authorized by the Admiralty and Jane Franklin, to whom Rae had given the objects he collected. The badge was subsequently presented to Greenwich Hospital by the Lord Commissioners of the Admiralty, on 2 December 1854. Lady Franklin appointed McClintock to command the ‘Fox’, which crossed the Atlantic and entered the Arctic Archipelago from Baffin Bay in 1857. Finding Peel Sound blocked by ice, McClintock sailed down Prince Regent Inlet and wintered at the eastern end of the Bellot Strait. In March 1858, a small sledge party led by McClintock and Allen Young met a party of Inuit near the North Magnetic Pole on the Boothia Peninsula. 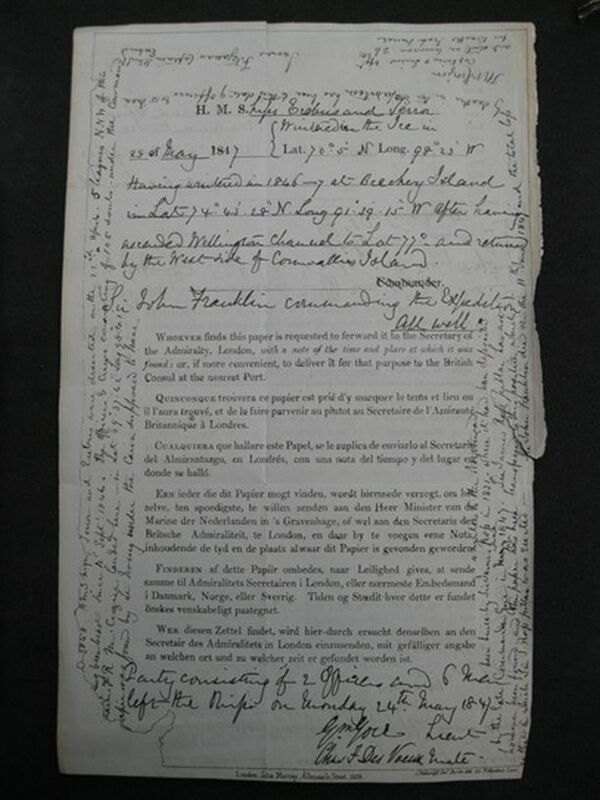 McClintock purchased a number of items that had belonged to the missing expedition. A larger sledge party also set out and found traces of the missing expedition at Cape Felix. Further south they came across the place where the expedition had reached the shore after abandoning ship. Nearby were found two records, each deposited in a cairn, that provide the only written evidence of Franklin and Crozier’s decisions and the expedition’s route. McClintock described the discovery in print in 1860, his account will be reproduced for the following blog post. Further down the coast at Erebus Bay, Hobson found a boat containing a large quantity of equipment and facing in the direction of the abandoned ships. He also found the remains of two men who had been armed with a couple of loaded shotguns at this site. When they crossed to King William Island they found a skeleton in the remains of steward’s uniform. The ‘Fox’ returned to London on 23 September 1859. Of all the voyages sent in search of Franklin, McClintock’s men provided the most information about the fate of the missing expedition. Later, the Fox was engaged in survey work off the coast of Norway in conjunction with laying a North Atlantic telegraph cable in 1860-61 before being sold to the Danish Royal Greenland Company. By the late 1880s Fox was owned by Atkies. Kryolith Mine-og Handels Selskabet of Copenhagen, and was refitted with a 17 n.h.p compound steam engine made by Burmeister & Wain. After a long and useful career Fox was wrecked on the coast of Greenland in 1912. Pre-1851 copies made for Sophia Cracroft on high quality salted paper, Derbyshire County Archives. 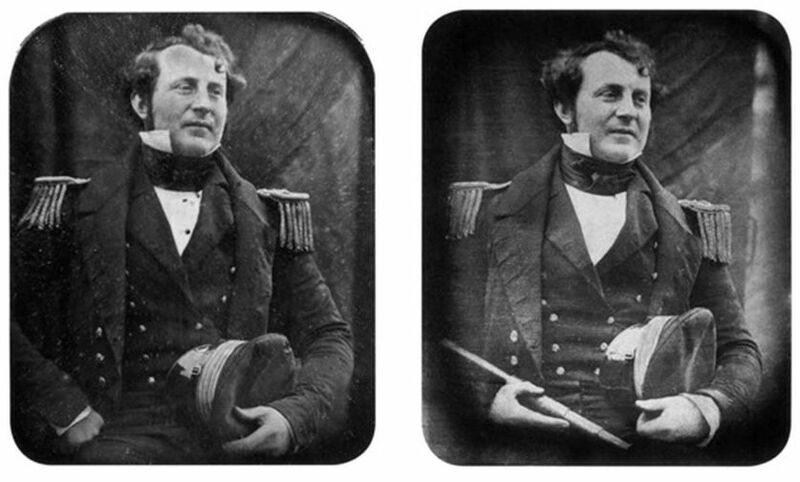 Among the most famous images of the Franklin expedition are the daguerreotype portraits taken of the twelve officers of Erebus in the run up to departure, together with Francis Crozier and James Fitzjames of the Terror. From a particular feature of the daguerreian apparatus (described below), we know the images were taken in pairs, making a total of twenty-eight images. Of the thirteen known originals still in existence, almost all are in the Polar Museum, which holds the glass plate image of Fitzjames and eleven of the officers of Erebus, missing only original portraits of Robert Sargent, (Erebus), and Francis Crozier, (Terror). The only other extant known original is nearly identical to the Polar Museum’s daguerreotype of Henry Le Vesconte, Lieutenant HMS Erebus and in the hands of Le Vesconte’s descendants. However, pre-1851 copies made for Sophia Cracroft on high quality salted paper (shown above) as well as other images distributed across collections and private ownership, have made it possible to glean some idea of the full set of twin images. Left, James Fitzjames daguerreotype portrait by Richard Beard, taken spring 1845 on the dockside at Greenhithe near HMS Erebus and Terror Polar Museum: N: 589/3. Right, a photograph of the original daguerreotype twin of the N: 589/3. 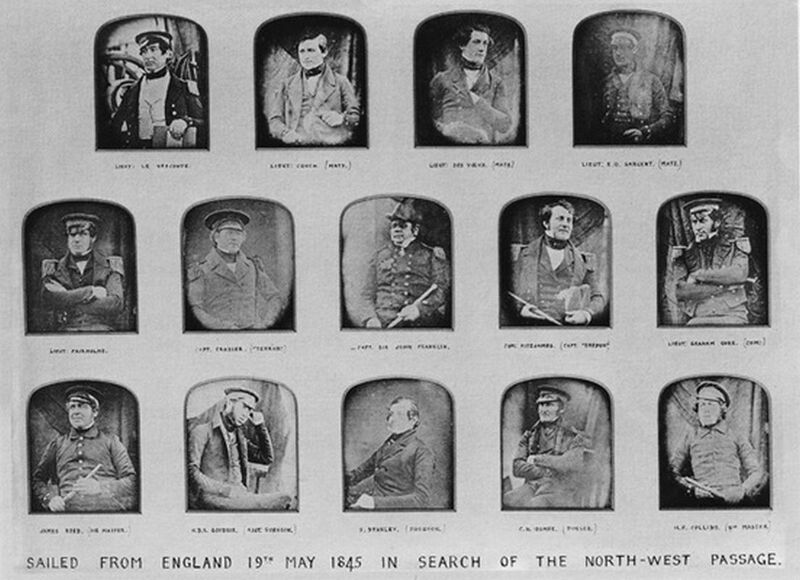 Thanks to Dr Huw Lewis-Jones of the Scott Polar Research Institute who was first to notice the phenomena, scholars of the Franklin daguerreotypes have been able to glean information about where the images were taken from the reflections in the peaks of the caps carried by Fitzjames and Lieutenant Graham Gore. Most of the portraits, including that of Sir John Franklin himself who was recovering from the flu, looking ill, and uncomfortably stuffed into his uniform, were taken in front of a cloth backdrop. However, the caps reveal this to be a temporary dockside studio rather than Richard Beard’s professional premises, illustrated by the infamous satirist George Cruikshank in 1841. 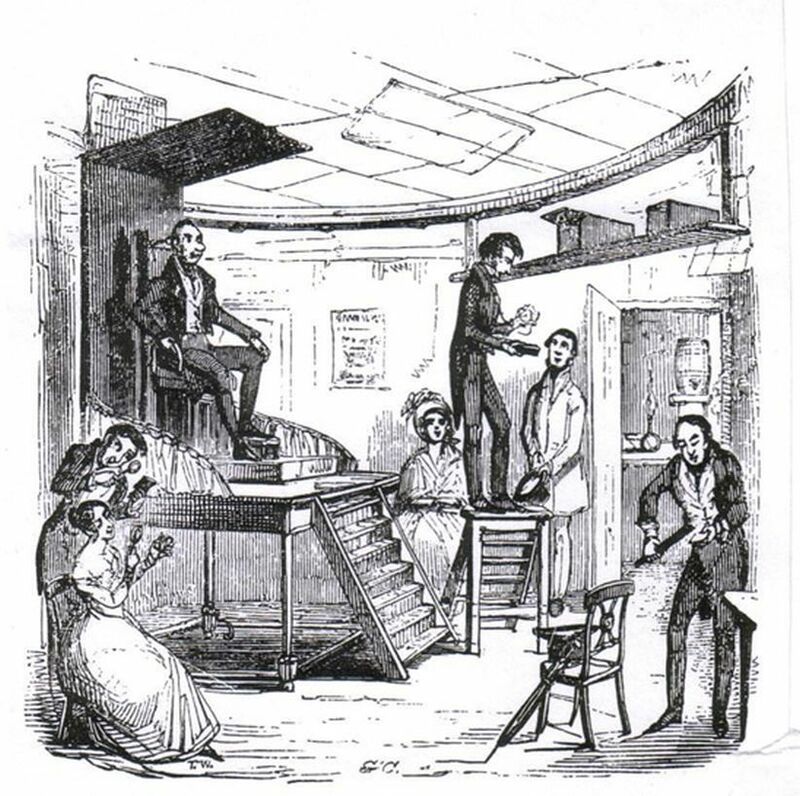 Richard Beard’s daguerreotype studio, illustrated by George Cruikshank, 1841. The photographer, Richard Beard, was a coal merchant who had taken to speculating in patents and one of only two men (the other being Antoine Claudet) with any kind of licence to make daguerrotypes. The twin images were a product of Beard’s mirror camera which had a singular feature: the mirror had a pivot something like a modern SLR camera, and by turning it the photographer could record two images on a single oblong plate. This gave Beard the opportunity to choose the better of the exposures, or – if both were satisfactory – provide two daguerreotypes and double his profit. This he did with the Franklin images, one set, now in the Polar Museum were given to Lady Franklin; the other once thought to have been given to the Admiralty, may have been purchased or distributed by relatives of officers. After the images were made the apparatus was stowed on Erebus. The challenges of sensitizing and exposing a plate, which required (at different stages) vaporizing both iodine and mercury, would have been considerable in the Arctic climate and there are no known Daguerreotypes of the frozen regions from this era. This blog post on the Franklin daguerreotypes draws heavily on the blogs and publications of Russell Potter (visionsnorth.blogspot.co.uk), William Battersby, (http://hidden-tracks-book.blogspot.co.uk) and William Schultz (The Daguerrian Annual, Pittsburgh: The Daguerreian Society, 2005). For biographical detail on Beard and his rise as one of the most influential figures nineteenth-century photography in England, see Hannavay, John, ‘Beard, Richard (1801-1885),’ Encyclopaedia of Nineteenth-Century Photography, London: Routledge, Vol. 1. 126-7. In 1844, a community of prominent magnetic researchers persuaded the octogenarian head of Admiralty administration, Sir John Barrow, to lobby the Admiralty for another Arctic expedition. In an orchestrated pincer movement, and keen to make amends for the disastrous Tasmanian appointment, the veterans of polar exploration, William Edward Parry, James Clark Ross, Francis Beaufort, Frederick William Beechey, and Peter Fisher, lined up to back Franklin to lead the expedition. The Erebus and Terror were both Hecla-class bomb vessels, refitted for Arctic service in the winter of 1835 and deployed on subsequent expeditions. Built for the bombardment of coastal targets, with capacious holds and extremely strong construction, bomb vessels had long been the Admiralty favourite for conversion into discovery ships. The influence of the lobbyists and famous explorers was such that when on 3 March 1845 the Admiralty ordered the Erebus and Terror should be prepared for sea, they were already under refit at Woolwich dockyard. Franklin relics in the Polar Musum, silver cutlery carrying London hallmarks, the maker’s mark of George Adams (GA), and Franklin’s family crest – a conger eel’s head between two laurel branches. Polar Museum N:980. Amid the hectic final preparations for a large crew, extreme conditions and a demanding programme of scientific observations, substantial effort went into keeping up appearances. Aberdeenshire whaler James Reid, appointed ice master for Erebus, wrote home on 13 May 1845 to complain of the expense incurred with every officer required to buy his own silver spoons and forks. 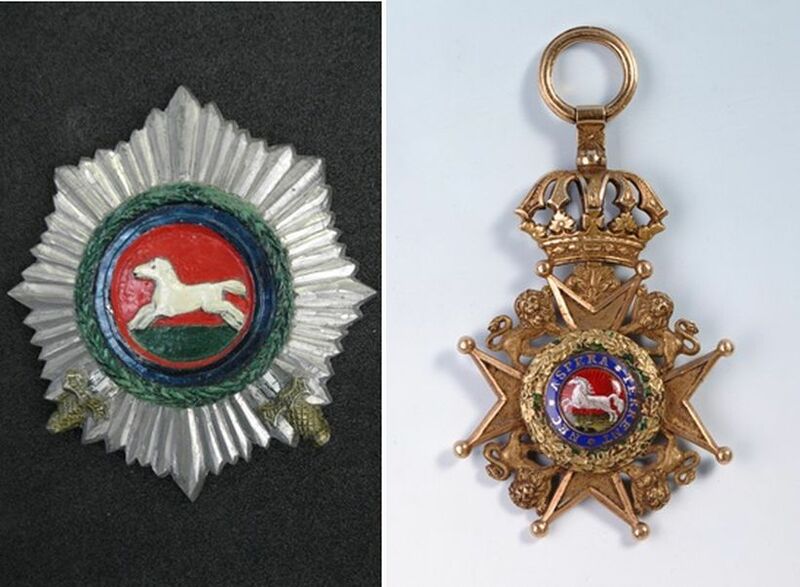 These badges of class and rank would become some of the most recognisable relics of the expedition, each item not only carrying the hallmarks of the original maker but also often the crests of individual officers. Because of these provenance marks the cutlery became a particular focus for search parties, with the McClintock Search Expedition (1857-59), led by McClintock himself, deciding to only acquire items associated with identifiable members of the missing Franklin expedition. Of particular significance, many of the recovered pieces bore more than just the crests and hallmarks; they also carried marks scratched into the silver that bore witness to layers of ownership. The marks, initials of crewmembers such as able seaman William Wentzell, quartermaster William Rhodes, and caulker’s mate Cornelius Hickey, were suggestive clues as to the fate of the expedition after all written records ceased. It seemed as though the officer’s silver cutlery must have been redistributed amongst the men, possibly to preserve it. One of the items of cutlery N:980 in the Polar Museum’s collection, carries a further testimonial. 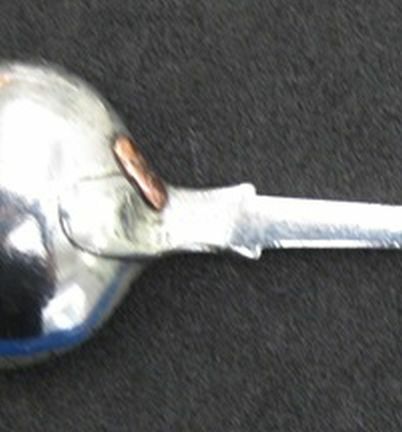 A silver tablespoon bearing Franklin’s crest – a conger eel’s head between two laurel branches – and London hallmarks, the date code for 1844-5, and the maker’s mark of George Adams (GA), also features a copper join; a repair made by Inuit from Repulse Bay. Stone cooking pots were also mended in this way, using copper almost like thread to stitch the broken material back together, see the Parry blogs for more detail. In the mid nineteenth century, white men had visited the Inuit camp and gifted this spoon, before dying from the effects of scurvy. When, in 1877, the whaler A. Haughton was wrecked on the north-west shore of Hudson Bay, crewmember Thomas F. Barry purchased the spoon. 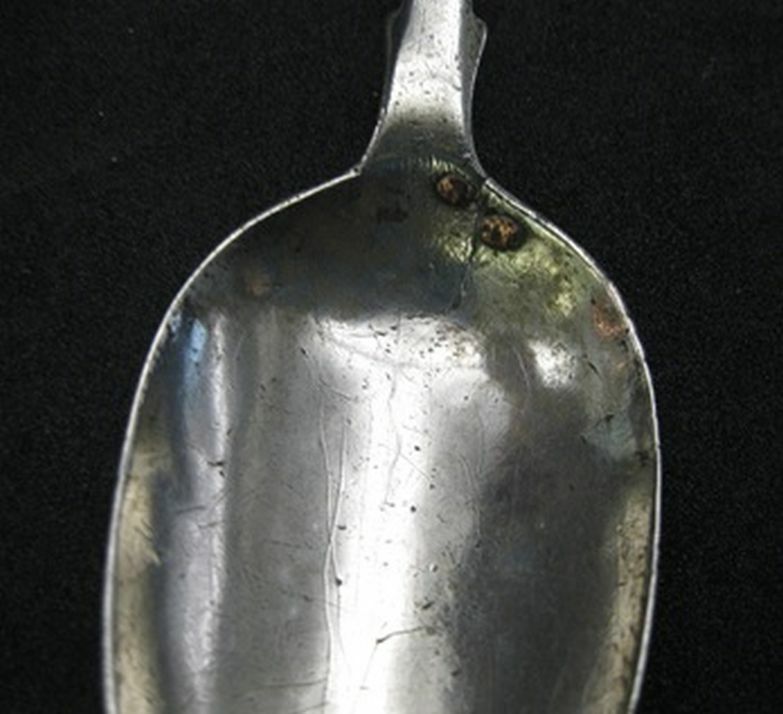 Barry sold the spoon on and it passed to the state department who presented it to Sophia Cracroft, John Franklin’s niece and Lady Jane Franklin’s companion, on 13 August 1878. Sophia Cracroft had been a companion to the Franklins out in Hobart where Francis Crozier, Franklin’s second in command, had fallen passionately in love with her. In the final preparations for departure, Crozier proposed to Cracroft; it was not his first attempt but it would be the last. When the expedition departed 19 May 1845, delayed four days waiting on final provisions, Crozier was in a state of deep depression. Cracroft had rejected him yet again and he set sail not expecting to return, well aware of Cracroft’s preference for the Arctic hero, James Clark Ross, ‘the handsomest man in the Navy’. Eleanor Porden and John Franklin married in 1823 following his return from the First Arctic Land Expedition in 1822. They had a daughter, also Eleanor, on the 3 June 1824, but the new mother’s health was irreparably damaged by the birth and she died of tuberculosis on 22 February 1825, just six days after John Franklin embarked on his second Arctic voyage carrying the flag she had embroidered to be raised when the expedition reached its furthest northerly point. Three years on from his wife’s death and the year after his return from the Second Arctic Land Expedition in 1827, Franklin married a friend of Eleanor’s, Jane Griffin. Jane Griffin, aged 24. Later Lady Jane Franklin. Lithograph by Joseph Mathias Negelen (18 Jun 1792 – 11 Jun 1870), after 1816 chalk drawing by Amelie Romilly (21 Mar 1788 – 2 Dec 1875). To commemorate the event, Franklin sat for Pierre Jean David D’Angers, the famous French portrait artist who toured France, England and the German lands between 1827 and 1829 making busts and medallions of illustrious men and women. 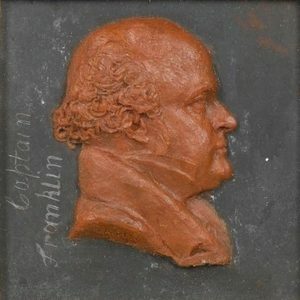 The wax portrait bust of Franklin, modelled on a slate base, was cast in bronze in 1829, the same year Franklin was knighted. The bust was donated to the Polar Museum in 1931 by the ‘Misses Lefroy’, Jessie, from Winchester and Louie, and M. Isabel (Mary-Isabella), who lived together in Bentworth, Hants. Their mother, Emma Cracroft, was Franklin’s niece and the younger sister to Jane Franklin’s lifelong companion and aide-de-camp, Sophia Cracroft. Their father was George Benjamin Austen Lefroy, a grand nephew of Jane Austen. When the bust N: 982. was donated, M. Isabel asked if the museum’s then director, Frank Debenham, could explain how it was that the original wax model remained in tact, when surely it should have been destroyed in the casting process, and further noted the particular value her aunt Sophia Cracroft had placed on the wax original. Debenham’s response was characteristically charming, but limited; though a bit late for Isabel Lefroy’s query (by nearly one hundred years), we now know more on the particularities of David’s technique and the value of the wax original. Bust of Sir John Franklin modelled by Pierre Jean David D’Angers. Polar Museum, N: 982. The majority of David’s portraits were sketched in wax from life. In his studio David would model the finished portrait in plaster to make the mould for the bronze castings. 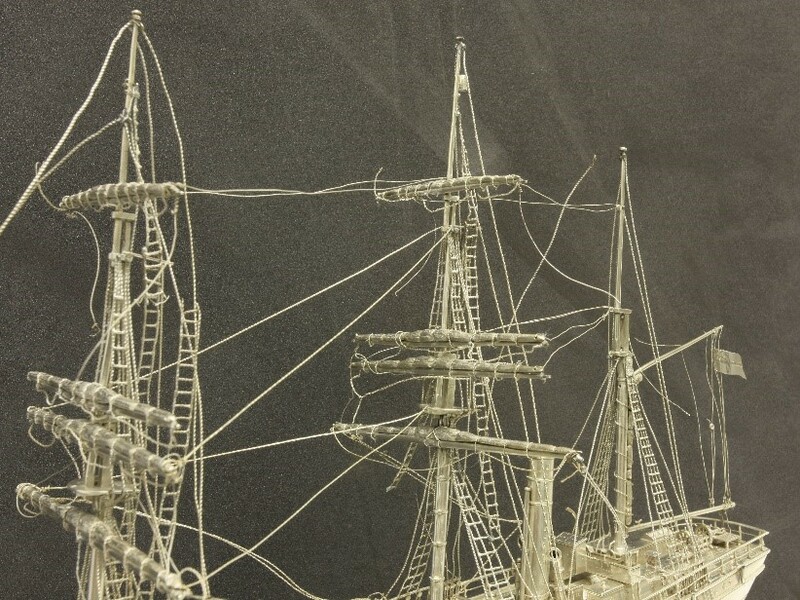 The plaster model was pressed into a matrix of fine wet sand to leave an impression on the reverse. Into this cavity, when dry, a sheet of wax was melted or liquid wax brushed, precisely conforming to every detail of the impression. The thickness of the wax determined the thickness of the case and formed the incuse reverse. Wax sprues for the introduction of molten bronze and vents for the escaping air were attached to the wax, and the whole was covered with a heat resistant mixture of sand and plaster. The wax was then melted out, leaving a cavity to be filled with molten bronze in a process known as lost-wax casting. After the pouring and cooling of the bronze, the mould was broken away and the cast, scarred on the reverse when relieved of its sprues and vents of bronze, became a foundry model and could be used to make many additional impressions for sand-casting. Bust of Sir John Franklin modeled by Pierre Jean David D’Angers. Now in a private collection. The replication of medallions by sand-casting is accomplished by placing the model, obverse up, on a tablet and completely covering it with fine sand contained within the upper part of a flask. When the flask and tablet are turned over and the tablet is removed, the exposed reverse of the model and surrounding matrix are revealed. This surface is dusted with a release agent, and the lower half of the flask is attached, filled with sand, and compressed. The sand in the lower half of the flask might be a less fine and more economical grade, as the reverse of sand-cast medallions often exhibits a grainier surface (as shown below). The two halves of the flask are separated, the model is removed, sprues and vents are cut into the sand, the release agent is applied, the mould is rejoined, and the resulting cavity is filled with molten bronze. When the cast is removed form the mould, the sprues and vents are filed off and the edge is smoothed of the irregularities caused by the intrusion of molten bronze where the two parts of the mould were joined. It is because of this last operation, evidenced by file marks on the circumference of finished casts, that medallions from the same foundry model can be of different dimensions. 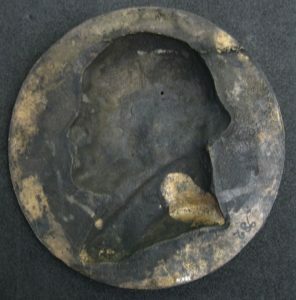 Reverse of bronze bust of Sir John Franklin Polar Museum, N: 982. The grainy surface from sand casting is quite distinct. When the casting process is complete, the bronze is given its colour, or ‘fire-patina’, by applying chemical compounds of sulphur, copper, and iron, among others, to oxidize the surface. This colouring process is distinct from “cold-patina”, whereby colouring pigments are applied to the bronze surface without further heat treatment. 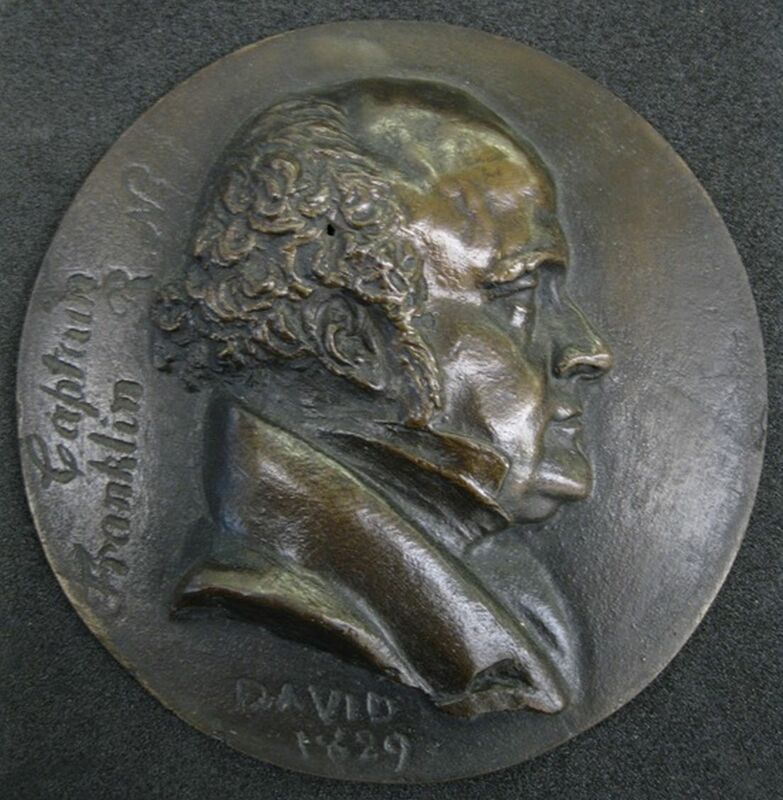 David’s medallions are characteristically shades of brown with the patinas on his early medallions a dark greenish brown, but they can range in colour from blackish brown, to light brown, to a transparent golden brown; this last being more prevalent on the medallions produced by Fumiere et Cie. The newlywed Jane Franklin was teasingly critical of the portrait and Franklin, writing to D’Angers to offer ‘My warmest thanks to you for this medallion which has delighted all my friends by the lifelike resemblance and the strength of its execution’, noted ‘My wife persists in saying that the nose is too long and that you have made me too handsome.’ From the sad unfolding of events it is clear Lady Jane’s disapproval was tongue-in-cheek. On 4 November 1854, a week after reporting the tragic fate of the Franklin expedition (28 October 1854), a now famous article on the Franklin relics appeared in The Illustrated London News complete with emotive full-page engravings of the broken relics of the expedition, recovered by subsequent search parties. These images were fully authorised by Lady Jane and crowned by a representation of D’Anger’s medallion portrait, though it had not been among the relics. The Polar Museum holds a significant collection of these infamous remains, that are so important not just to understanding the Franklin disaster in Victorian Culture, but also for thinking about what the Polar Museum is all about, and even for understanding current debates around Arctic sovereignty. After his marriage to Jane Griffin in 1828 Franklin began planning another Arctic expedition, but the Admiralty had lost interest in polar exploration and withdrew their support. Between 1830 and 1833 he served in the Mediterranean during the Greek War of Independence, and following his return and three years unemployment, he was offered lieutenant-governorship of Van Diemen’s Land, now Tasmania, exploited by the British as the primary penal colony in Australia between 1800 and 1853. John Franklin’s limited experience of administration, the couple’s mutual interest in social reform, and the well-educated, literary, and scientific Lady Franklin’s unconventional behaviour were a recipe for disaster with the conservative high society of the colony. In 1843, six years after arriving in Van Diemen’s Land, the Franklins were recalled to Britain, his confidence shattered and Lady Jane determined to recover their self-esteem. The Polar Museum holds a button from Franklin’s governor’s coat (N:757). The pulling apart of the status coat, reduced to a humble button, is eloquent of Franklin’s time in the colony; but alongside the relics recovered from the Arctic it takes on new meaning. Buttons were not only collected and revered as tokens of the lost heroes but were manufactured by the search parties, stamped with information such as the date, place, and ships’ name, and distributed among the indigenous people they encountered in the hope of making contact with the lost Franklin expedition. Since the expedition’s first disappearance, buttons have offered a way to recover Franklin. The button is not the only fragment of the Franklins’ time in Tasmania held by the Polar Museum, two pieces of coral from the Indian Ocean feature in the collection. These were originally housed in a leather-covered seaman’s chest, along with exotic shells; stones cut and polished; zoological curiosities, such as the sword from a swordfish; and fossils and minerals from all over the world. 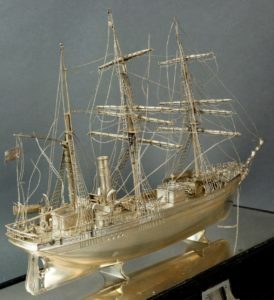 A card lain on top of the chest documented the sad provenance, sold by Lady Franklin at her Hedingham Castle bazaar 9 July 1850 ‘… in aid of the funds for fitting out an additional ship sent chiefly at her Ladyship’s expense, in search of the missing expedition to the Arctic regions, under the command of Captain Sir John Franklin.’ The corals are remnants of this chest, and the Franklins’ time in Tasmania, later broken up and sold off in pieces. When the couple reached England in 1844, the Admiralty were again looking to polar exploration, this time as part of the major international collaborative campaign to survey the earth’s magnetism, which would come to be known as The Magnetic Crusade. With Admiralty advisors and administrators keen to make amends for the disastrous Tasmanian posting, Franklin found himself, despite his age, in pole position to take command. 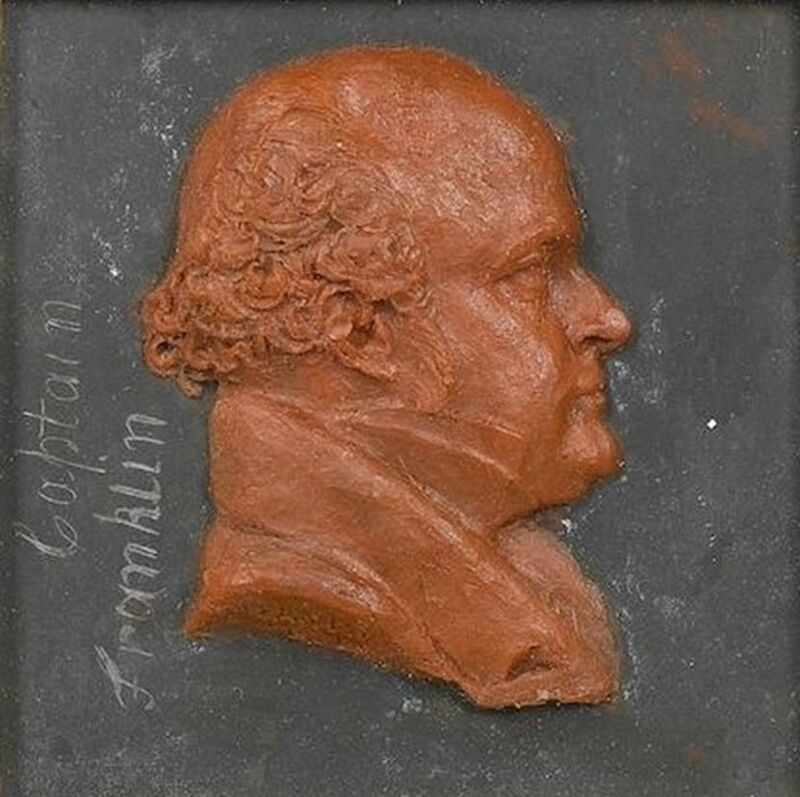 To the very day that last fateful expedition set sail Franklin remained obsessed with correspondence and pamphlets attempting to revise public opinion of his Tasmanian humiliation. It was impossible not to be struck with the difference between our present complete state of equipment and that on which we had embarked on our former disastrous voyage. Instead of a frail bark canoe, and a scanty supply of food, we were now about to commence the sea voyage in excellent boats, stored with three months’ provision. The party wintered at Fort Franklin on Great Bear Lake from September 1825 till June 1826, before descending as far as the mouth of the Mackenzie River on the North American coast where the party split into two on 4 July. Nineteenth century Admiralty charts weren’t just projections and plotted data, they also included detailed coastal views; the quality of which were crucial for future surveyors and navigators. The same well-drawn church spire or rocky peak would be used over and over by different surveyors as a reference point to orient sightings. For this, but also as part of the Admiralty’s publicity campaign around such voyages, each party had its own artist. Richardson’s group, in the Dolphin and Union, took assistant surveyor Edward Nicholas Kendall to survey the coast between the Mackenzie and Coppermine Rivers; while Franklin, in the Lion and Reliance, attempted to go west from the Mackenzie to Icy Cape with officer-artist George Back. The obstinate continuance of fog forms another material difference between this season and the same period of 1821. We were only detained three times in navigating along the coast that year to the east of the Coppermine River; but on this voyage hardly a day passed after our departure form the Mackenzie that the atmosphere was not, at some time, so foggy as to hide every object more distant than four or five miles. Weather observations were an important component of the expeditions and published alongside the narrative accounts of the officers. In addition to supplies, clothing, boats, and bibles, the expedition had a whole suite of astronomical, magnetic, and meteorological apparatus. To have some idea of how well any instrument was working, every instrument needed to be compared against a designated standard. The twelve thermometers on the expedition give some sense of the sheer amount of scientific apparatus the parties were carrying. Ten ivory-scale thermometers made by James Newman from his London premises at 7 and 8 Lisle Street, which he occupied in the years 1816-25, were regularly compared with one another and then the instrument which gave the readings nearest the mean temperature of the whole set was compared with one of two thermometers made by member of the famous Dollond family of scientific instrument makers and recently elected Royal Society Fellow, George Dollond of St Paul’s Churchyard, London. Trust in the Dollond instrument, based in complex reasons of society, genealogy, and class, was used to calibrate the best of the Newman instruments. One of the Newman thermometers from the expedition is held by the polar museum (Y:54/21/1). A note on the reverse of the ivory scale identifies the Polar Museum’s thermometer as the one used in the Observatory in the two sets of winter observations before being removed on 1 May to register the temperature of the open air. Ivory Newman thermometer from the British Naval Exploring Expedition (Second Arctic Land Expedition) 1825-27, Polar Museum Y:54/21/1). 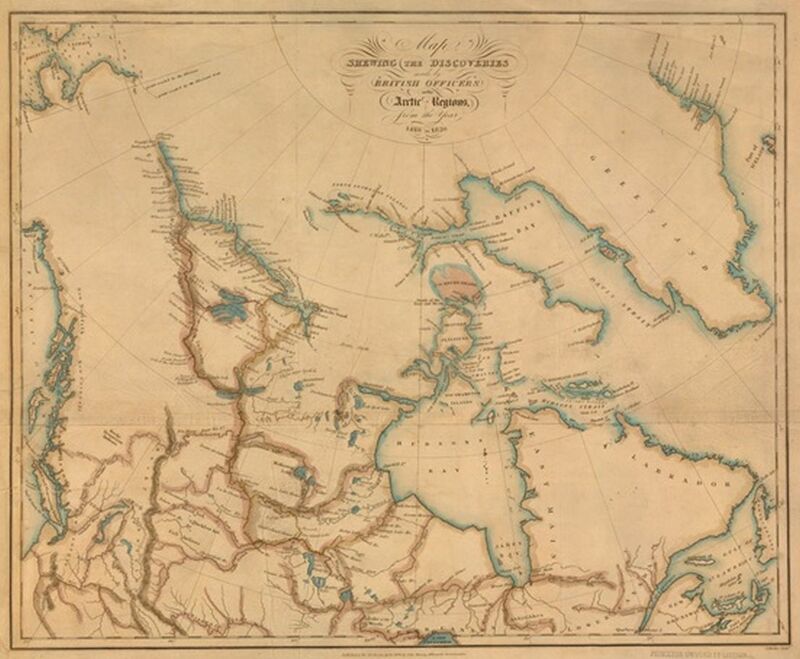 Despite the challenging weather, the two parties successfully charted over 1100 miles of ‘undiscovered’ coastline along the Beaufort Sea, now known as the Amundsen Gulf, between July and September 1826. The total number of miles surveyed and mapped was closer to 5,000; but as these were routes had long been traversed by fur traders, Franklin omitted them from his ‘discoveries’. Franklin’s party turned back within only 160 miles of the British Naval Exploring Expedition 1825-28 (HMS Blossom) captained by Sir Frederick Beechey that was advancing eastward from Icy Cape. Map “Shewing the Discoveries made by British Officers in the Arctic Regions from the year 1818 to 1826,” from John Franklin, Narrative of a Second Expedition to the Shores of the Polar Sea in the years 1825, 1825, and 1827 (1828).